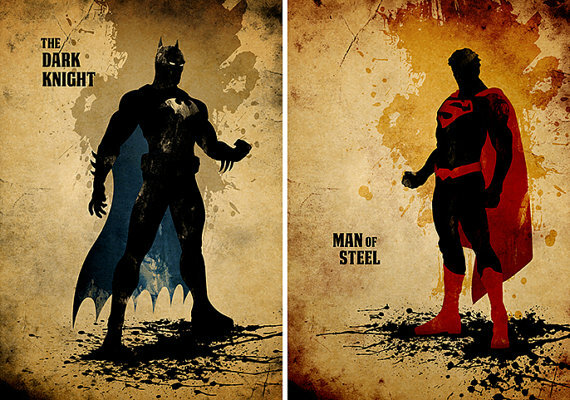 Those minimalist posters are Amazing! I love ATLA! Also, yes please enter me for the Marvel print. It's fantastic! My-oh-my. 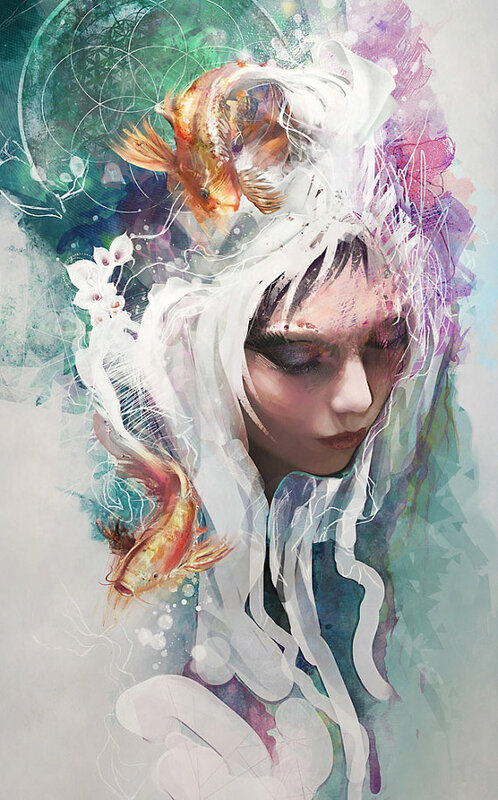 I've never been so in love with ALL the art pieces you selected for an art roundup. And I think that Marvel picture is the bee's knees. Or the cat's pajamas. I always get those two mixed up! Love the Golden Books. Thanks for links! The Leia one is great! I always love these roundups so much! Hello! I would like the David Tennant card pleeeeeeease! Oh, the retro Guardians poster is sooo cool! I'm also digging the Marvel character roundup, too! My daughter would love the Marvel roundup! And I would love so many of what you have posted! I've just been thinking I have some blank spaces on my walls... I'd love the Marvel roundup, or, you know, about 15 over on the giveaway board :D.
Ahhh! 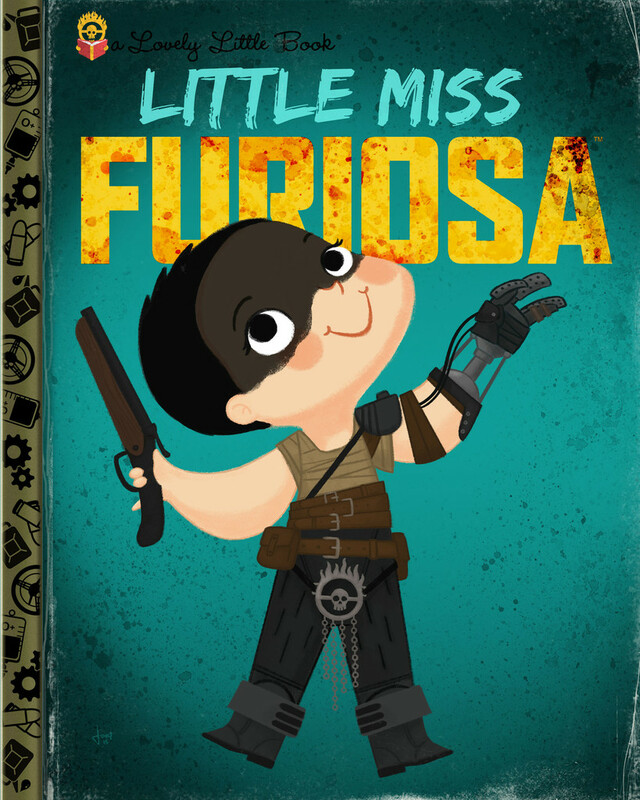 Little Miss Furiosa is amaaaaazing! And my husband would go crazy for the marvel roundup! I love the Marvel one! Amazing stuff like always! Those Little Golden Book parodies - OMG. Oh man I was thinking the Little Golden Book series was actually books! Interesting fact: Western Publishing, from my home town, created the Little Golden Books. REALLY want the Goblin King. Or Leia. Just finished my craft/art/hideout room, so now all I need is some fabulous art for the walls! Is it wrong, that i just really wanna hug little Jareth? No? Good. Because I do. I really, really, do. Love the Marvel print too! What an amazing group this month! My Christmas list just got much bigger, lol! I would love to have either of the extra pieces also. I can't believe they haven't been snapped up yet. Thank you again for sharing! So much adorable art!!! Love both of the bonus giveaways! 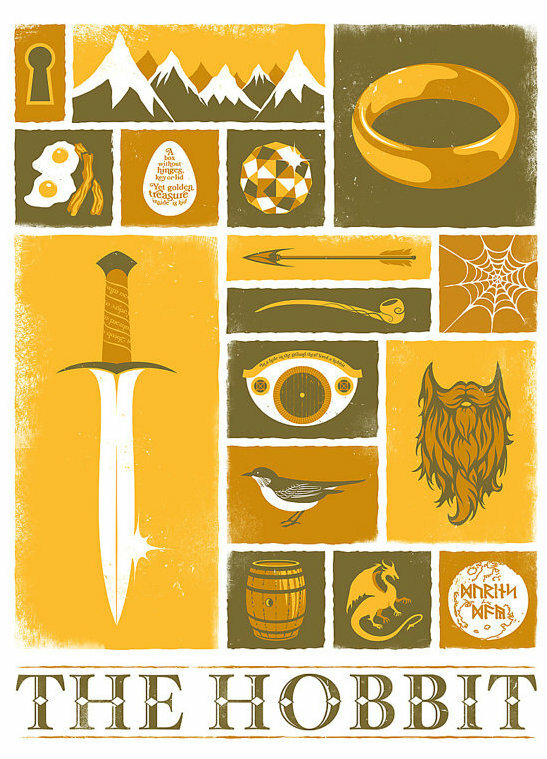 I love the minimalist posters!!! I'm torn on the bonus 2. I love princess Leia but my son would go nuts for the marvel one! Gah too much to decide! 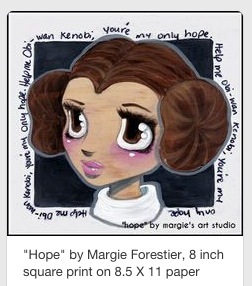 I would LOVE either the Leia or Marvel print! They are Fantastic! I love the minimalist and the objects collection posters! I love the Belle print and of course the Marvel print. Such great art. I love the golden books! I love Langevin's collections of objects prints! I think they'd be awesomely subtle nods to your favorite fandoms mixed in with other art. Omg, that Marvel one! I'm in love with Rogue. Ugh, I love everything SO MUCH. You find the best stuff! I want to be entered in ALL the drawings, forever, amen, thank you. I'm always a sucker for movie poster styles, how adorable! I'm loving water colors right now! My house is going to be so geektastic! I love both the extras this month too! Sign me up! you always find the best pictures and have the best timing. thank you so much for the pick-me-up and for all you do with these giveaways. Fingers crossed there is some awesome stuff on the board right now! Oh whoa, so much goodness! Crazy about Jeff Langevin now. I would love to be entered in both bonus drawings, thank you so much! I still need the WamPal! But that Marvel poster is great too! Oh my word. He did those with colored pencils? How? I am excited to see him sell them. Wow! Must. Have. The Little Rebel Princess. How do you find these people - amazing! I'd love either of the extra pieces, too. Such great stuff this time. I'd be interested in both additional pieces as well. First time commenting!I love the drawing of Merida, so beautiful! Please enter me in the bonus drawing for the Marvel poster! This time around you have a LOT that I love! And of the wild cards, I'm seriously digging the Marvel Universe. 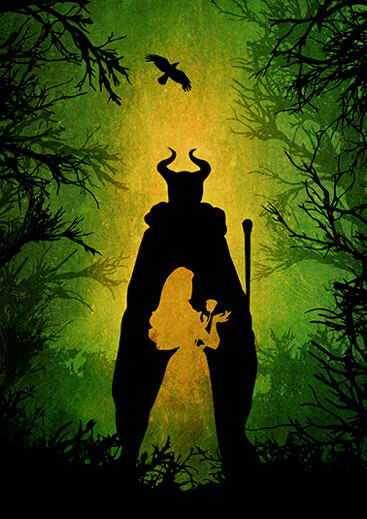 Minimalist Maleficent!!!!!!! As my birthday present? That Merida is absolutely amazing. I really like the Pixar roundup. Sooooo much good stuff on your board right now! "Allo, is close enough," and "In there you must hang" cracked me up completely. And I would love any of the extra prints, so add me to those drawings, please. I have to try every month, you know just in case. 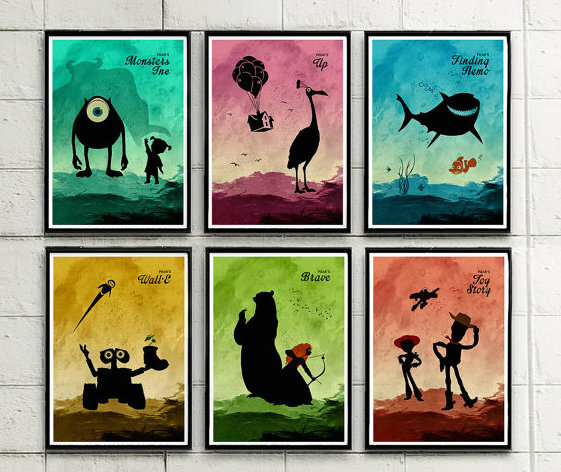 Love the minimalist and the Disney sketches! And I'd love to be in the drawing for the Marvel roundup!! They are all so amazing! The Marvel roundup would make a great gift! I love all the artwork from Moon Posters! I need a bigger art budget. Also, that Marvel artwork is adorable. Love the Pinnochio/Blue Fairy one from Megan Carrigan! And once in her shop, the Aurora pictures & the fairies! Gorgeous! 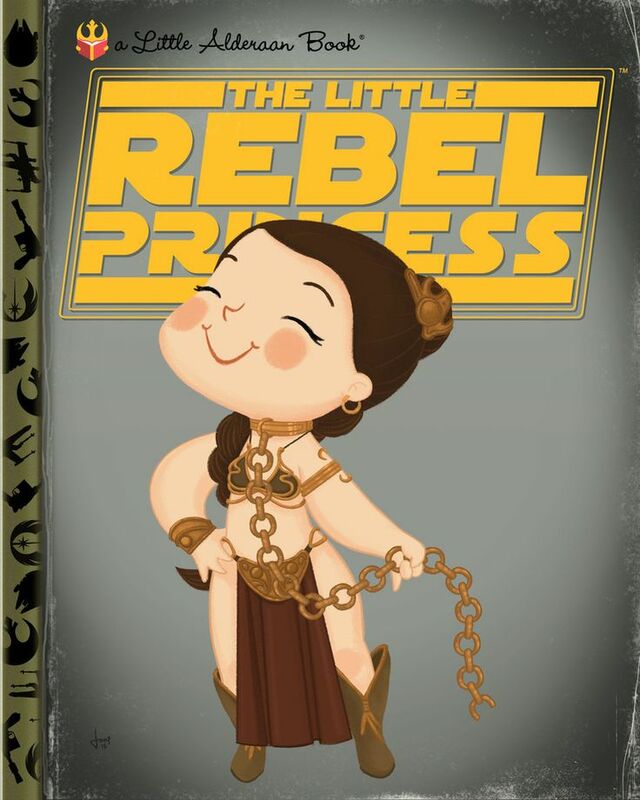 LOVE LOVE LOVE the Leia....and those golden books are...well...golden. So many to love. Please sign me up for receiving anything you're giving away! 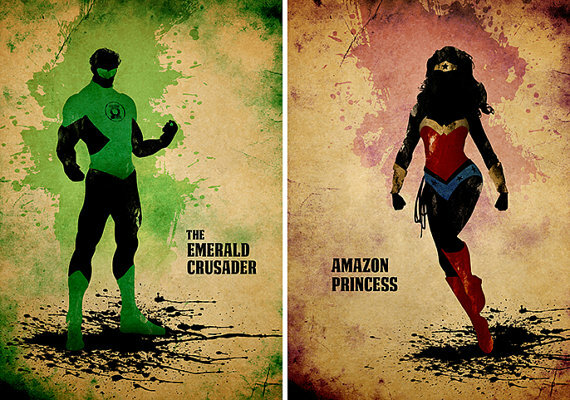 Your geek art taste is second to none! :D Thanks!! The Golden Books are awesome, Noticed the spines right away. Enter me for all the drawings! I don't need some free art... but I NEED some free art! Awesome picks this week! As always, a nice round up. I am adding the Little Golden Book parody to my holiday list. And please include me in the drawing for the extra pieces. Still hoping to win Toothless for my nursery! I would love either of the extra pieces or something off the board. Fingers crossed! I'm trying so hard not to click the links in this post. I have no more wall space! That geeky dragon print is just adorable! I also love ALL the Doctor Who stuff! I would also like the Avengers art for my friend's super hero themed nursery. Oh! And I like the Marvel piece! 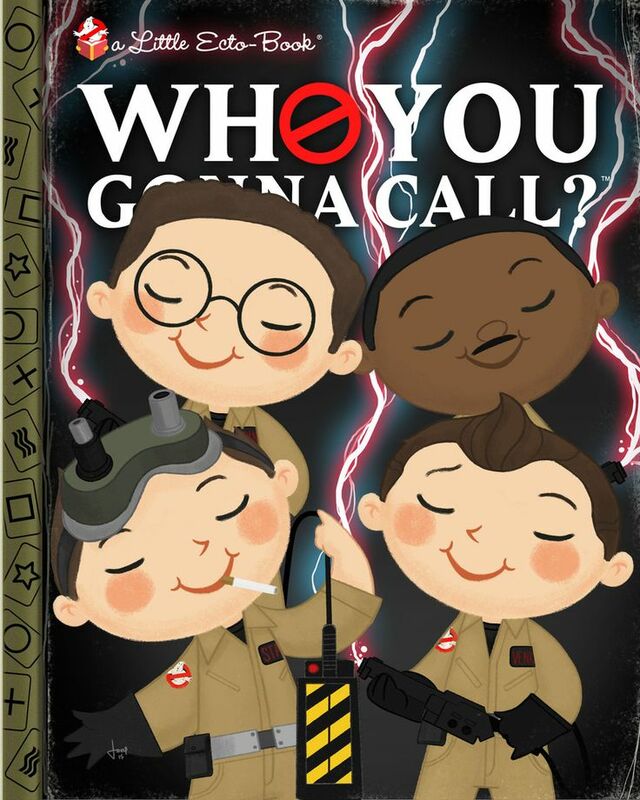 The Golden Books are adorable! Please enter me in the extra drawings, too! I can tell I'm going to be spending the rest of my day (and my paycheck!) on the Little Golden Books! Oh, and I would love to be entered to win "Hope." One of my son's ballroom dance partners (she's 9) is a HUGE Star Wars fan and would flip for that one!! Would love to win any of this artwork! So cool! Always look forward to what you find. I've put some from past months on my Christmas wish list. The Pixar group has to be one of my favorites of all time. I will now be stalking, I mean, following all these artist on Facebook and my Christmas shopping will be super easy. I can't wait to send my nephews the golden books!! So many pretties! As per usual with you and your wonderful websites, which I love SO much, and am so appreciative of. Thank you for all that you do. Hope your Thanksgiving is lovely, and now thinking of you at Thanksgiving makes me wonder about steampunk cornucopias... hmmm... see what you've done to me?! I want to steampunk everything now. Virtual hugs to you both! Amazing art once again. I would love any of them! I love those Pixar posters! You're right, they look great in a group. I'd like to win the Marvel group print. 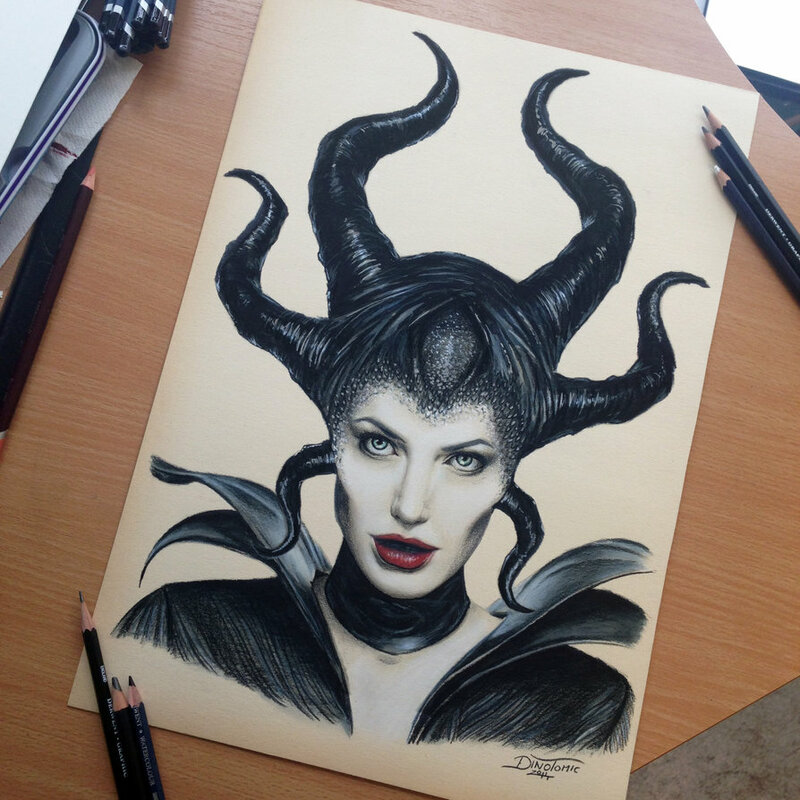 Wow, Dino Tomic's work is amazing! Thanks for sharing all these wonderful finds. I love the Marvel print too! Another awesome round of art, as always! 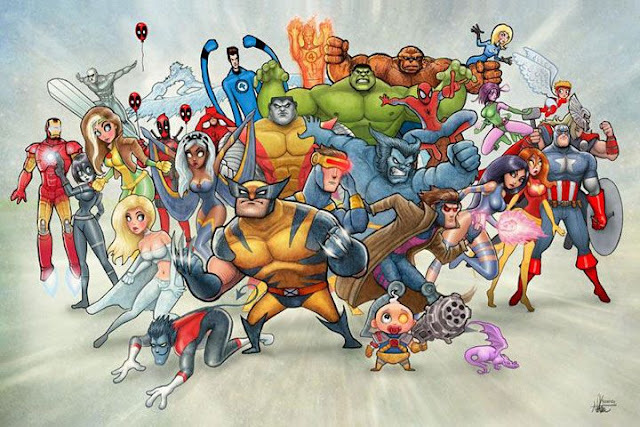 I also like the group Marvel print--the stylization is cute without lowering their badassness! I'd love to get some awesome art! That Marvel print is killer! I like them all, but the two extras might be my favourites! Yay! Love this! If chosen, I will choose! Gosh, I think I like every piece this month! But that unnamed character with the goldfish. LOVE. pick me pick me pick me pick me pick me! WOW! 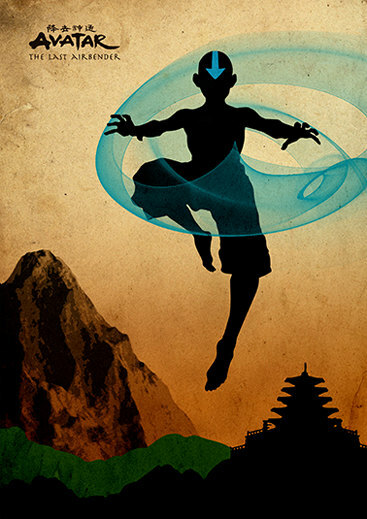 I believe strongly that the world needs more Avatar art and fan theory and everything! And, I've actually had my eye on the "Hope" print for a while now. Anyway, I hope I win but I will happy for whoever does. Pick me! Also, I love the extra avengers print. Fingers crossed! 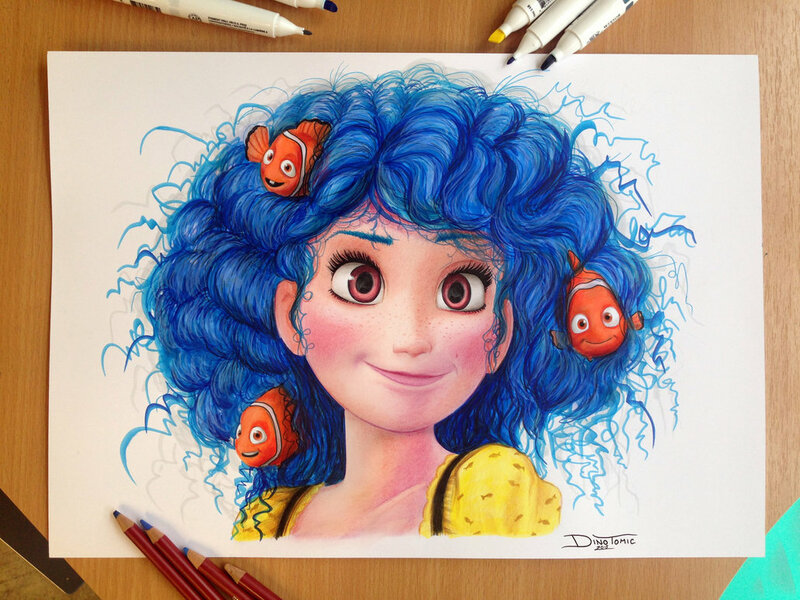 Dino's work is jaw-dropping gorgeous. Always fun to browse new artists with you. Love Dino's work it is so good. I love all of this art! I would be thrilled to win either of the extra two, or something from the board! ~Krystine M.
The think my son would love the marvel print in his room. That is some perfect Merida hair. Good roundup! 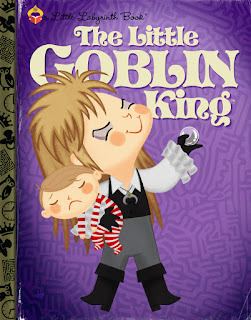 Aw, I totally want to read The Little Goblin King. Those Little Golden Books are so brilliant! Man, we need more wall space! But I would definitely have room for a little something from the giveaway board...so, pick me!! Love those parody golden books! So cute!! Seriously in love with that Merida! This monthly round up is one of my favorite things on the internet. It always makes me smile. The marvel one is amaaaaaaazing! The fun fandom item collection ones? I desperately want a Babylon 5 one. I checked, he doesn't have one. But if he ever makes one, I'm SO all over that! Ooh, that Firefly object collection is calling me. You see have been trying so hard to resist the little golden parodies....sooooo hard. OMG I want absolutely everything you've found this month! The Leia and Marvel ones at the end are amazing too! Wow. I'm speechless. Every single piece you found this month is pure gold. And yes, I'd be happy to surprise my daughter with either of the extra giveaway ones at Christmas. You're making me want to remove the current movie posters from my walls and re-do everything with the Minimalist prints. The Marvel one is amazing! I've been present shopping for my husband, and that is the first thing that I've seen that screams his name. I always love your art roundups and this month's is no different. Eep! You always find AMAZING art! 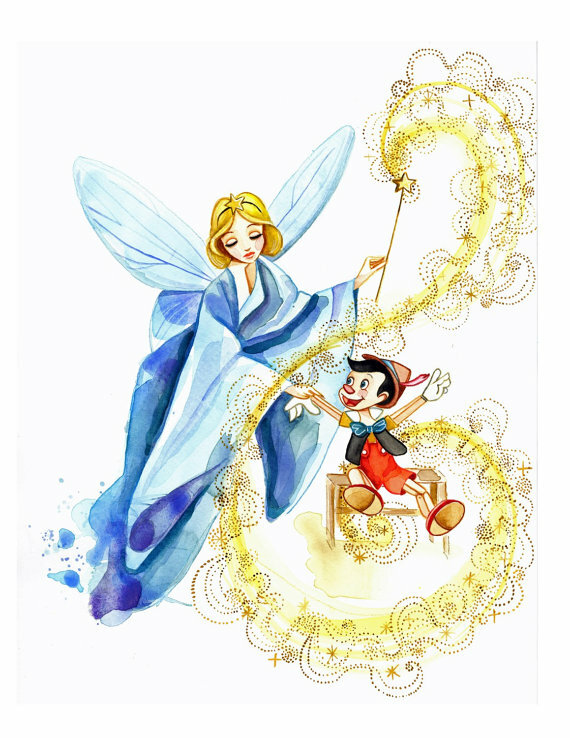 Love the Disney sketches and I really want to do my entire apartment in minimalist and/or silhouette geeky prints...somehow, I don't think my poor boyfriend would approve haha. I love those Little "Golden" books - especially the Little Labyrinth edition. As usual, I love everything ELSE you found, too. Thanks for taking the time to explore for the rest of us. And Marvel Round-up! I count on your roundups for awesome art ideas - count me in for any of the giveaways. Thank you! Wonderful roundup, as usual! My favorites are the silhouettes and the Little Golden Books. Please enter my name for the Leia piece and the roundup. Thanks, Jen! I SO want that Firefly poster! Jen, you find the BEST stuff! And i always miss the drawing. Maybe this month! I've followed cakewrecks since just few months after that infamous first sprinkles cake! If you pick me, i would love the "you can be anything" girl for my own little geeky baby girl. Dat Little Goblin King! Love it! As it IS my Birthday, I figure I give it a shot at winning. You always find the most amazing artists and images for your giveaways! Ooh! 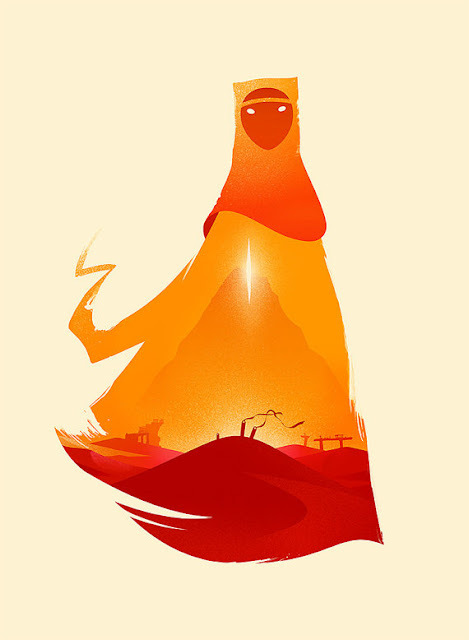 Those minimalist posters look amazing! Also love that Marvel round up!!!!! Those "Little Golden Books" are amazing! 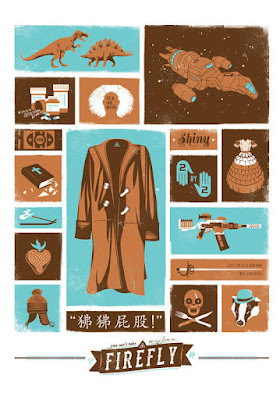 And I love both the Marvel round up and the Leia print. Those object collection prints are pretty cool. Thanks for the chance to win. 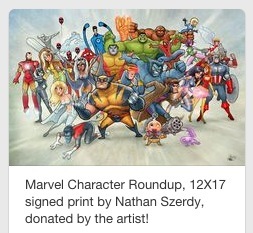 I'm interested in both the Marvel character round-up and the Princess Leia print. Those Golden Book parodies are so fun! I love those Little Golden books! And the fandom object collections. Some great gift ideas here for the holidays coming up! And speaking of gifts, I definitely want to be entered in the extra drawing for the Marvel poster-- the boyfriend is obsessed with Marvel, and I still have no idea what to get him for Christmas! How am I supposed to pick just one? Every month I find another one I love. ::smh:: I clearly need a bigger budget for decorating my home! 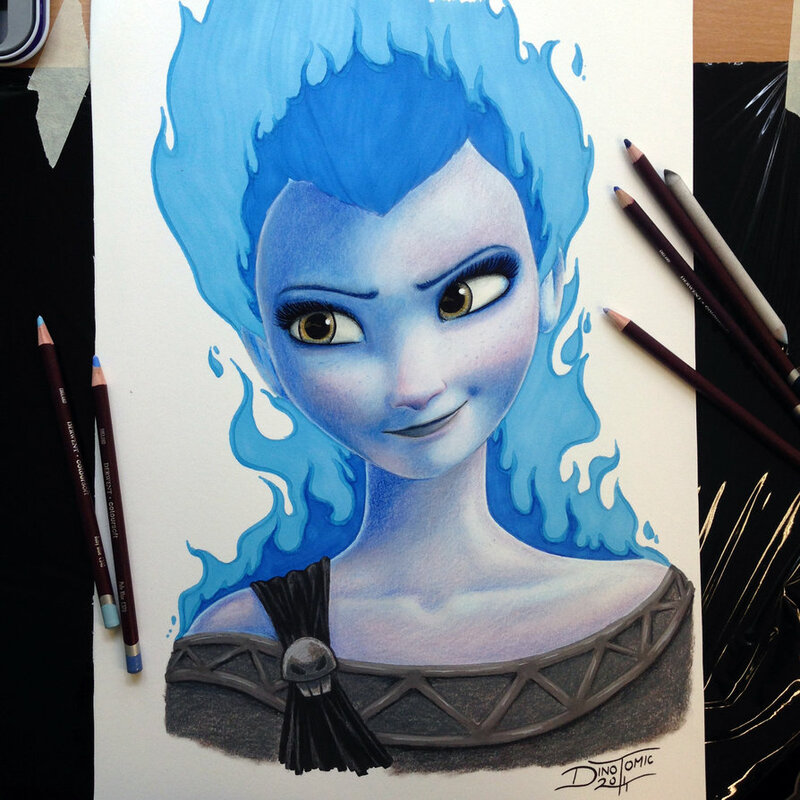 Is it me, or is Elsa-Hades pretty much the best mashup idea ever?! As always, love them all! I want the Leia print, please! I always look forward to your art roundup posts. They get me thinking about how I can free up more wall space to display more geeky art! You have a great eye and I love that you introduce people to such great artists! The giveaways are so great too. Thanks for doing them. Of the extra pieces this post, the Marvel one is my favorite but I love them both! 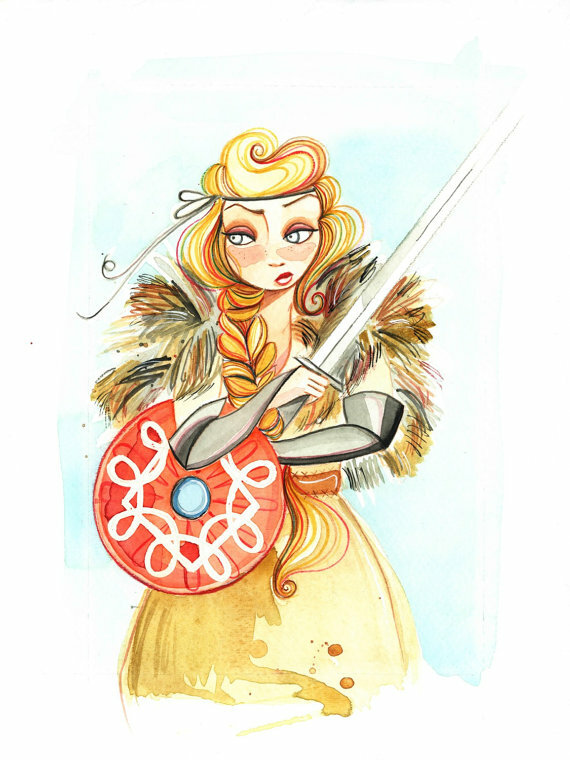 I am getting that Viking princess one, for sure! Thank you for sharing these wonderful artists with us! It's great to find new works of art, even if not all of them are sold online. I love all of the art you post, and wouldn't mind having any of it! :) But if I get chosen, I would love to have the Marvel print...there is so much going on in it! 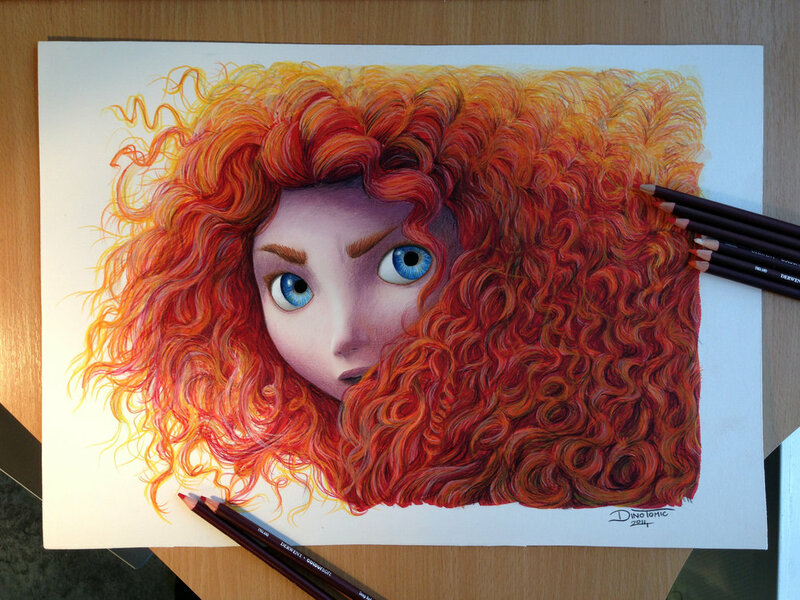 I love the Brave colored pencil drawing! And the Marvel one too! Oh my gosh! As I was scrolling through I was thinking "these are all rather nice", then I saw the Little Goblin King! I need that in my life. I am in love with the Langevin watercolor- those fish in her hair!!! too awesome :) As always, great roundup Jen! And I happily submit to all the Drawings (see what I did there? lol)! Relatedly, I really want to thank you for doing these giveaways- it means a lot to me, as a geeky, fannish person who can rarely afford art due to financial difficulties lately, that there's a chance to get these things even when I can't put together the money the artists deserve for them. If I had all the budget in the world for it, my walls would be covered in art. Kind people like you mean there's a chance I can manage that /without/ starving in order to afford it. Plus, your round-ups always seem to lead to me following more artists. You have /excellent/ taste. I really need some little golden book covers. I wonder how much effort it would take for the artist to make a whole book...? That Merida is stunning! Would definitely consider purchasing a print if Dino offers them. The Marvel Character Roundup is also awesome! You can be anything/girls are super. I am still love with those chubby legs. Love, love, love the Princess Leia!!! I love them all!! The Marvel and Leia are awesome too! Elsa as Hades makes me so happy, and I can't explain why. Also, I would love to have "hope"
Absolutely amazing, as always. You have such a good eye for art. I love Dory! My wishlist just got a lot longer! 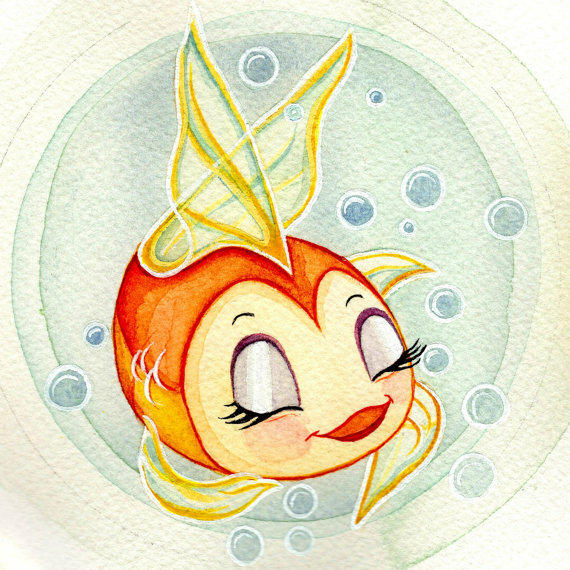 The alt Dory makes me giggle. So many good Baymax prints on your giveaway board! 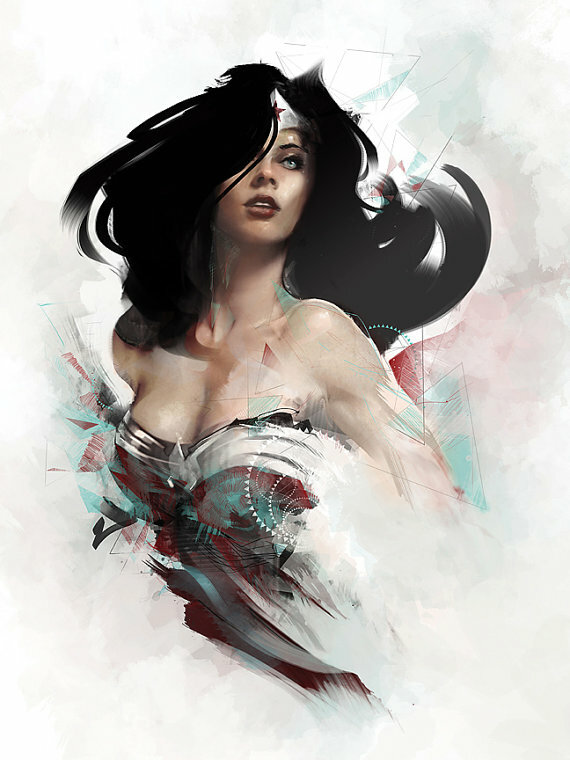 Enter me for that lovely stylized Wonder Woman. Though the alternate Dory is very striking as well. Nice! I really like the Marvel roundup. I'd like to be entered for all three drawings! Love the round-up. You find the best stuff. Ooooo!!!! All 3!!!! So pretty!!! I love the marvel one!!! My boyfriend and I love comic books and especially the marvel world!!! Please enter me for all three. You have great taste! Oh! I love the Dory one! Fingers crossed for the wildcard. The Doctor Who art nouveau set is still fantastic! Repping my favorite princess right at the top. 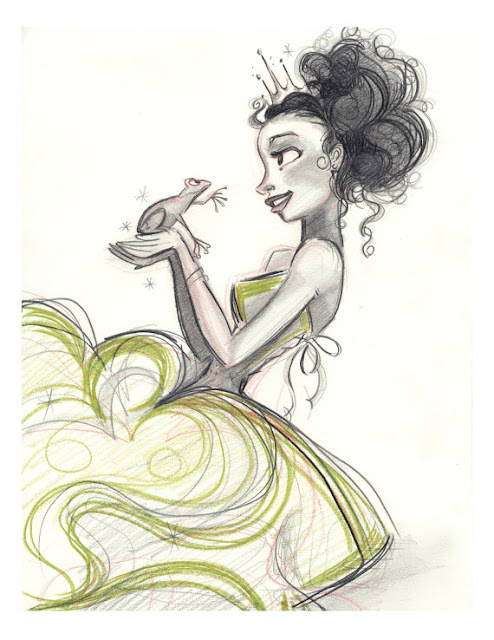 Tiana is such a fantastic character and I see so much of myself in her! I'd love to be considered for either the wildcard, or the Marvel print. Oh good selection. If I got anything maybe I'd take the stitch print. 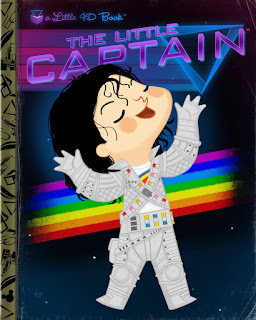 First - I want all of the "Little Golden Book" parodies - :) I couldn't even choose one that is a favorite. And I have always loved both of the "extra" prize options today. Though the Marvel is probably my favorite of the two. I love the silhouetted ones or the little golden book ones, but the airbrushed ones are gorgeous too. The Marvel extra prize is totally awesome! I love them all :), I would love to be considered for both. OMG that Marvel roundup piece! LOVE IT, want it, need it in my life.